Students’ negative experiences of science in the primary sector have commonly been blamed on poor teacher content knowledge. Yet, teacher beliefs have long been identified as strong influences on classroom practice. Understanding the nature of teacher beliefs and their influence on primary science teaching practice could usefully inform teacher development initiatives. In science education, teacher beliefs about teaching and learning have been proposed as key influences in the development of pedagogical content knowledge for science teaching. This paper uses a multiple qualitative case study design to examine the nature and influence of beliefs on the practice and knowledge development of three generalist primary teachers during the implementation of a unit of work in science. Data for each case study included observations and transcripts of recordings of the lessons forming each science unit, together with multiple interviews with the teacher throughout its implementation. 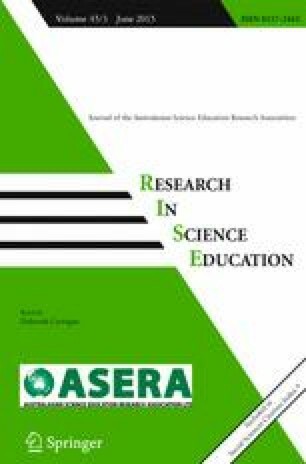 Findings support those of other researchers suggesting that beliefs about purposes of science education, the nature of science, and science teaching and learning strongly influence teacher practice and knowledge. Beliefs about the purposes of science education were found to be a particularly strong influence on practice in the observed cases. However, beliefs about students and the teachers’ aims for education generally, as well as teachers’ notions concerning vertical science curriculum, were also crucially influential on the type of science learning opportunities that were promoted. Beliefs were found to additionally influence the nature of both subject matter knowledge and pedagogical content knowledge for science developed by the teachers. Bull, A., Gilbert, J., Barwick, R., Hipkins, R., & Baker, R. (2010). Inspired by science. A paper commissioned by the Royal Society of New Zealand and the Prime Minister’s Chief Science Advisor. Retrieved June 27, 2011, from http://www.nzcer.org.nz/pdfs/inspired-by-science.pdf. Chamberlain, M., & Caygill, R. (2012). Key findings from New Zealand’s participation in the Progress in International Reading Literacy Study (PIRLS) and Trends in International Mathematics and Science Study (TIMSS) in 2010/11. Retrieved March 25, 2013, from http://www.educationcounts.govt.nz/__data/assets/pdf_file/0011/114995/Key-Findings-NZ-Participation-in-TIMSS-and-PIRLS-2010-2011.pdf. Education Review Office (2010). Science in Years 5 to 8: Capable and competent teaching. Retrieved June 6, 2010, from http://www.ero.govt.nz/National-Reports/Science-in-Years-5-to-8-Capable-and-Competent-Teaching-May-2010/Overview. Education Review Office (2012).Science in the New Zealand Curriculum Years 5 to 8. Retrieved December 13, 2013, from http://www.ero.govt.nz/National-Reports/Science-in-The-New-Zealand-Curriculum-Years-5-to-8-May-2012/. Goodrum, D., & Rennie, L. (2007). Australian School Science Education National Action Plan 2008–2012. Volume 1. The National Action Plan. Retrieved December 12, 2009, from: http://www.dest.gov.au/NR/rdonlyres/94684C4C-7997-4970-ACAC-5E46F87118D3/18317/Volume1final_28August2008.pdf.